You are here: Home » MEDIA » Books » Time’s Convert (All Souls Universe book 1) by Deborah Harkness (book review). Time’s Convert (All Souls Universe book 1) by Deborah Harkness (book review). 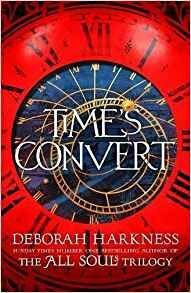 ‘Time’s Convert’ is book one in the ‘All Souls Universe’ series by Deborah Harkness, it follows on from the ‘All Souls Trilogy’ but focuses more on the side characters. This book focuses mostly on Marcus, his past and his present, going from when he was a small child in the American Revolution to his conversion into a vampire by Matthew. We also get chapters from Phoebe Taylor, Marcus’ soon-to-be-partner as she is being changed into a vampire. Alongside these there are chapters by Diana showing us what she and the rest of her ever-expanding family are up to. I was so nervous going into this book as I loved the first trilogy so much and it has taken so long to get this new instalment. I was so worried that for some reason I wasn’t going to enjoy it as much but I needn’t have worried as after a couple of chapters, I was back into this world and the book was unfortunately whizzing by. I really loved learning more about how vampires are created in this world. Each paranormal world seems to have a different way that this happens and this one turns out to be quite scientific now that we’re in the 21st century. It’s all to do with measuring quantities of blood apparently. It was amusing to read how young vampires have to learn to control their new strength and speed, so that they don’t end up crushing all the expensive furniture and leaving gouge marks in the floor. They also have to learn to deal with their hyped-up senses including being almost hypnotised by any form of light. This tends to be glossed over in other vampire books. I also enjoyed learning a lot more about American and French history than I did before. I have to admit I knew nothing about the American Revolution or the French Revolution but I now know a lot more and I’d love to read more not only in these books. I really enjoyed reading those historical chapters from Marcus’ point of view, seeing the medical advances that he was seeing was really interesting. I’m not 100% sure how accurate these facts actually are but I enjoyed them nonetheless. I really enjoy how each book Harkness comes out with is actually from a different genre. With this one being more a typical romance or family saga than her previous books. I like that she’s trying out the different genres but we get to learn more and more about the characters we already know and love so it’s not too confusing. I did find that this book was a lot less exciting than the other books by Harkness. You do spend a lot of the first part of the book wondering when the excitement will start or the point of the book will become clear. But once you realise it’s a family saga rather than a thriller, it all makes sense and you can settle into enjoy it. There were a lot less thrills and spills but I still enjoyed it immensely. Overall, I really enjoyed this book and can’t wait for the next in this series to come out as I’m assuming we’ll be looking at some of the other side characters from the first trilogy. Well done, Deborah Harkness, on creating yet another fabulous book! « To the Moon and back with SpaceX (for a price).